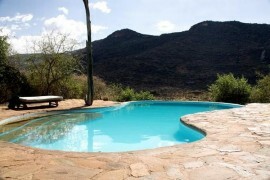 Loisaba Lodge is located in a 61,000acre private ranch in Northern Laikipia. 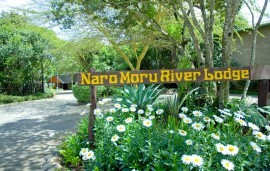 The ranch has the Ewaso Nyiro River running along its Southern boundary. Loisaba also practices responsible tourism through the Loisaba Community Trust, a local charity supporting local communities. Loisaba Wilderness has over 260 species of birds and 50 species of wild animals. A visit to Loisaba is truly unforgettable and will revive the mind, rejuvenate the spirit and revitalize the soul. With the land area at Loisaba being so large, there are countless things to do here. The first thing to do is game drives looking out for the big 5. Fishing can be done along the river and the lodge will pack a picnic and drinks. For adventurous guests, rafting at the Ewaso Nyiro and Ngare Narok rivers that pass through Loisaba is pretty exciting. Horseback riding, trekking on camels, mountain biking and visiting the Masai village are some of the other activities that can be done at Loisaba. Accommodation at Loisaba can be at the lodge, the house, cottage or their unique star beds. Loisaba Lodge is constructed using local materials and is situated at the edge of a plateau with views of Mt. Kenya to the south. It has 7 ensuite rooms. 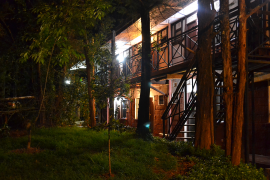 Loisaba House has 2 ensuite rooms, one double and one twin. The house is an exclusive self contained house. It has its own staff, game drive vehicle and swimming pool. 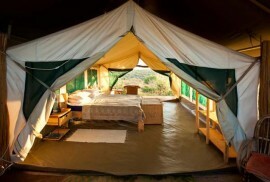 Guests get the opportunity to try a night under the unspoilt Kenyan stars on one of our Star Beds. Loisaba Cottage has 3 double ensuite rooms and one mezzanine room with a detached bathroom. The cottage is about 9km from the lodge. The cottage is fully self contained with its own staff and swimming pool. Meals at Loisaba are taken in different settings, and the vegetables and fruit come directly from the gardens at the lodge. Breakfast is served at the main dining room, while lunch is served outside under the shade of trees. Afternoon tea can be taken at the deck from 4pm. Dinner is also served at the dining room, and guests have the option of taking a bush dinner. Guests can also take drinks at the sitting room in the evenings before dinner.